Offering updated references, questions for reflection, the latest case studies, and current advice relating to data protection and storage, this second edition of Enhancing Practice through Classroom Research provides an accessible introduction to understanding and improving teaching and learning through a process of reflection, research and action. Divided into 5 sections, this self-study action research approach emphasises the positive aspects of enhancing practice and reflects how this can lead to higher levels of teacher autonomy and agency. Drawing on the authors’ new experiences of working with second level, third level and post graduate educators, as well as their work designing post graduate programmes in the field of critical reflection and self-study action research, this friendly guide provides a straightforward approach to classroom research. 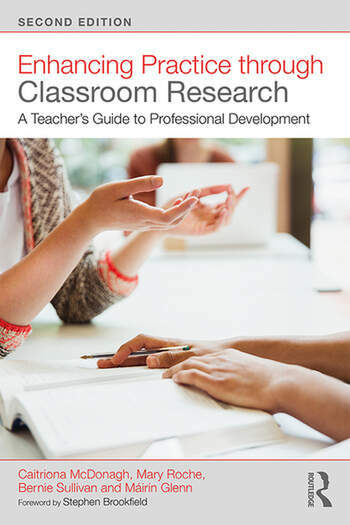 It is the perfect resource for all student and practising teachers looking for support in classroom research, as well as those wanting to pursue effective professional development or further studies in an area of interest. Chapter 3: How Can I Develop a Better Understanding of my Practice? Chapter 5: How Do I Show the Situation as it is, and as it evolves? Dr. Caitriona McDonagh is an education consultant in postgraduate teacher education and action research. She had previously researched her practice as a teacher of students with special education needs. Dr. Bernie Sullivan is a retired primary school principal and committed practitioner researcher. She is an educational consultant and supervises postgraduate action research projects. She is a reviewer for EJOLTS, and co-convener of NEARI. Dr. Máirín Glenn has extensive experience as a teacher and now works as a consultant for classroom research. Her work as co-convener of NEARI reflects her passion for values-based research. In this latest and revised book, the Irish authors have provided a well-written, very well referenced and accessible inspiration for teachers anywhere to investigate their practice. The book provides clear guidelines and questions to stimulate self-study action research while interspersing the advice with meaningful and credible accounts of how this has been done in each author’s own practice. I warmly recommend this book to any wanting to enhance their own teaching practice. If you’re setting out on a journey, travel with companions who know the territory but encourage you to explore your own path. The authors of this new edition of Enhancing Practice Through Classroom Research: A teacher’s guide to professional development provide readers with a thoughtful and supportive guide to developing and carrying out their own action research processes with a view toward deepening practice and encouraging personal and professional growth and well-being. Enjoy this opportunity to discover new ways of seeing the world, but don’t expect to come back unchanged! Reading this book is like talking to four wise and kind mentors. It is full of conversations that I wish I’d had as a beginning teacher, as a new postgraduate student, and as a new university lecturer. In fact, it is also the type of conversation that I still value and benefit from forty years into the job. The authors skilfully draw on their own, and other experiences, to explore, challenge and develop their own, and their readers’ criticality and educational thinking. In doing so, they have produced a text that is theoretically rich, while being fully grounded in the practice of education. Mary McAteer. Department of Professional Learning Edge Hill University, UK.